Yes, I am a sucker for Valentine's Day. I love sending out handmade cards to friends and family. For Christmas, my sister-in-law gave me a pack of die-cut oversized cardboard "Rolodex" cards. They demanded that I turn them into Valentines. 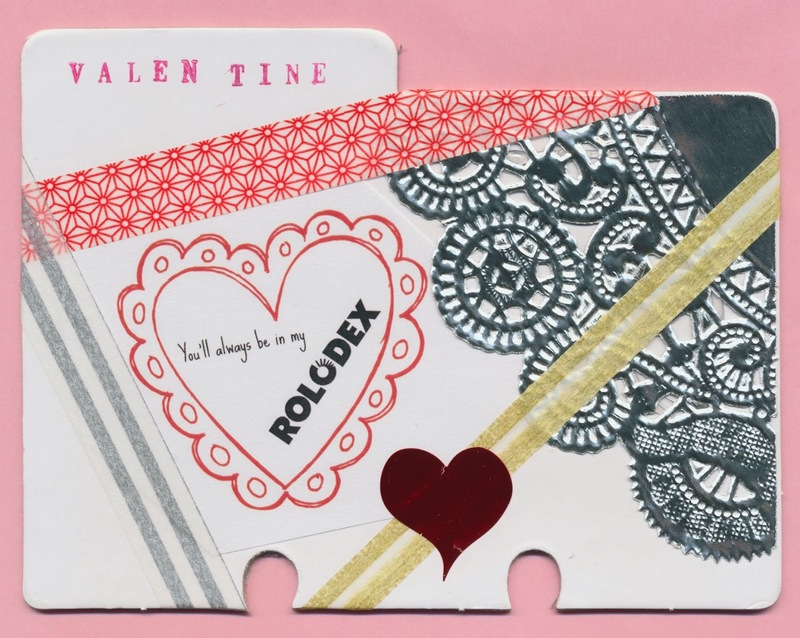 Rubber-stamps, happy tape, cut-up foil doilies, et voila! Happy Valentine's Day. May yours be full of love, and chocolate if that's your thing. Really great. Love the bit of doily. Now, what's all this "rolodex" business? Is that an Android thing? It's evidence of my affection for you that I enjoy your enjoyment of VD. 'Cause I really hate VD. I have SUCH a dysfunctional relationship with Valentine's Day. I hate the commercial pressure and the plethora of 'this would make a great Valentine's Day gift!' commercials (no it wouldn't, it's a toaster). But I would be all over making cookies for Eve to take to school and having her cut out hearts for all her classmates, EXCEPT, it's one week after her birthday and the cake raffle and I am generally baked-and-cutted OUT by then. So we don't do anything because I'm exhausted and then I feel bad that we didn't do anything.